Beaky Malone is a self-confessed Olympic-level liar. He tells so many crazy lies he drives his family completely mad, particularly his sister, Jodie. On a road trip with extended family and ever-present dog Destructo, Beaky’s lies are bigger and more elaborate than ever. Just when Jodie reaches breaking point, she and Beaky are sent out in search of fish and chips. Instead, they come across the mysterious Madame Shirley’s Marvellous Emporium of Peculiarities, home to the world’s only truth-telling machine. After Beaky’s shoved inside, it and *gasp* it actually works, Beaky can tell nothing but the truth. At this point, the story really ramps up the fun factor, with Beaky revealing everything from gross personal habits to his canteen lady crush. This is a super fun read for mid to older primary school aged readers who appreciate a bit of sarcasm, and will understand references to Instagram and the like. 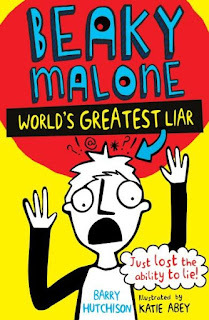 The outrageous truth-telling capers don’t stop at the end of the book though – a second title in the middle grade series is due out in January.